Barcelona is now widely recognised as one of the most successful cities in the world, internationally acclaimed for its innovative urban planning. It has survived the economic, environmental and social changes of the last decades through focusing upon the provision of knowledge-based and information services to place itself in the forefront of a new urban wave, in which city planning provides high-quality opportunities for people to live and work. In short, Barcelona has been transformed into a city that provides a highly impressive urban environment to all who visit it. The foundation for Barcelona's transformation has been the city's Eixample district, a garden city expansion of 520 street blocks planned as long ago as 1859. Its high quality architecture, egalitarian design and ease of access have stood the test of time and it provides the model for modern city developments today. The modern transformation of Barcelona began with preparations for the 1992 Olympics. Faced with serious problems of urban decay in both inner and peripheral districts, planners took a holistic approach and used the Games as a vehicle for city-wide reforms. Olympic facilities were spread over four neglected urban areas, with the Olympic Village, developed on abandoned industrial land close to the coast, the best known feature of this period. The construction of six artificial beaches either side of the Olympic Port has had the most impact and for the first time in its history, Barcelona has been able to turn and face the sea with pride. At the same time, a radical transformation of inner city districts began, with a policy of improving the social capital and mopping-up the marginal inhabitants who had given the city a reputation for serious crime. Barcelona is now undergoing a third wave of transformation. A high technology zone (22@), hyper-community (Diagonal Mar), the Universal Forum of Cultures 2004 and a new container port and logistics park are the key developments, all constructed on coastal brownfield and reclaimed land. Inner city and peripheral reforms are continuing and attention, a century on, is being refocused on the Eixample. Many of the residential blocks which have lost their interior open space to industrial development are seeing a gradual return of communal gardens. The most important reforms are illustrated in the slide below. Behind the dazzling international image, Barcelona has a darker side. The marginal inhabitants are being effectively exported to the periphery. One crime-ridden district, La Mina, on the edge of the Universal Forum developments, has been targeted for reform, but satellite towns as far as sixty kilometres from the city are beginning to experience new social problems. Barcelona is one of the most compact cities in Europe, an advantage for designing-in sustainability, but leading to serious problems of noise (from both traffic and people), traffic congestion and pollution. For students of geography, the city is a perfect fieldwork site. 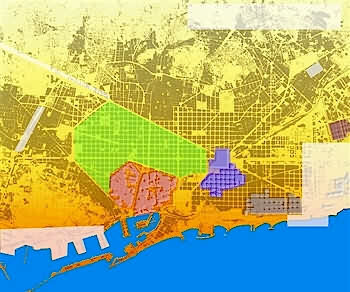 Barcelona provides an ideal model of urban management, with very accessible case studies of inner city renewal, brownfield site development, peripheral reforms and planning for the sustainable city. The socio-economic patterns clearly reflect the processes associated with urban growth and change, and models of urban processes and structure can be easily applied. The physical site is small, urban sprawl has been restricted by topographical constraints and most study sites are within walking distance. A wide range of census data and other small area statistics are available which enable a thorough analysis of the impact of urban management strategies and allow continuing change to be readily identified. Barcelona, though, is not all work! Its artistic tradition has much to offer the visitor. The varied architecture (particularly that of Gaudi), and the city's close association with many famous artists including Picasso and Dali give the city a strong creative 'edge' which pervades many aspects of urban life. Barcelona is also the capital of Catalunya, one of Spain's most distinctive and dynamic regions, with its own language, traditions and a strong sense of separate identity. There is a great sense of civic pride within the city and a competitive resolve to always outshine Madrid.